Party Box Design: Spooooky Halloween Bar... progress pics! Spooooky Halloween Bar... progress pics! Saturday will be here before I know it... the day of our "Budget Friendly" Halloween Party! Now mind you, I have acquired quite a few party throwing items, so to help me save money I will be re-using these items... but giving them an updated look! I also mentioned that I had planned to spend this past weekend thrift shopping and boy oh boy did this lady SCORE! When I saw this gem of a find, I just knew it would be perfect! 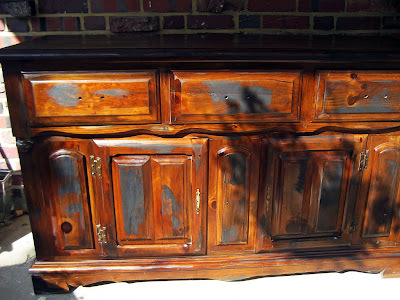 This buffet was ONLY $60! Yes, you read that right! With a lil sanding(done), stain(done), paint and hardware I am going to make this baby beautiful... spooky chic actually!!! Hope you all had a fab weekend!!! Ohhh and if you have any finds you would like to share, plllllease post your links below! 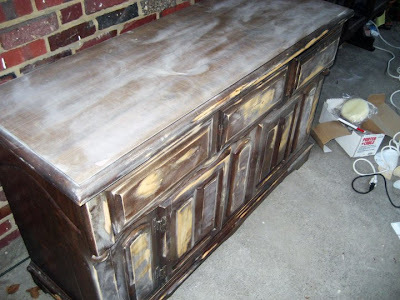 I loooove refinishing furniture, when I find the time! thanks lady... me too! i have no idea how incorporating the teal will look!!! Love it! I posted a quick little side table we spray-painted this weekend! Only $10 at the local ReUse store! You gotta give us a preview of your Halloween Party!! cant wait to see how this all turns out!